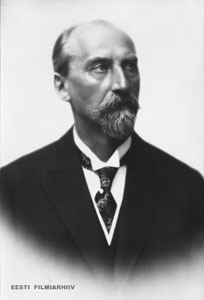 As a member of the Estonian Students’ Society, Peeter Põld met several outstanding individuals who had considerable influence on his development and on his becoming a politician, journalist, educationist and temperance activist. He was a close friend and colleague of Jaan Tõnisson, and he became one of leaders of the so-called “Tartu Renaissance”. 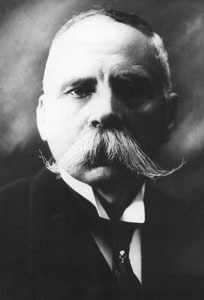 Jaan Tõnisson, the acknowledged leader of the national movement at the beginning of the 20th century, was a central figure in the struggle to promote Estonian culture and education. Peeter Põld also shared the social views and national ideals espoused by Estonian Students’ Union alumni Oskar Kallas and Villem Reiman. 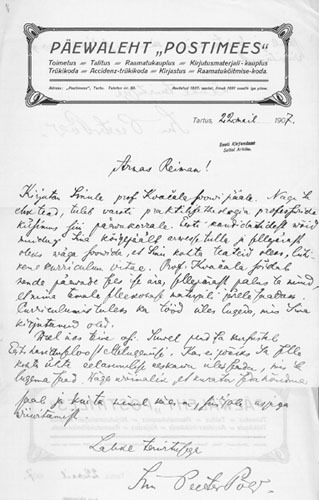 Following the example of Villem Reiman, Peeter Põld became an abstainer and supporter of the temperance movement in Estonia. 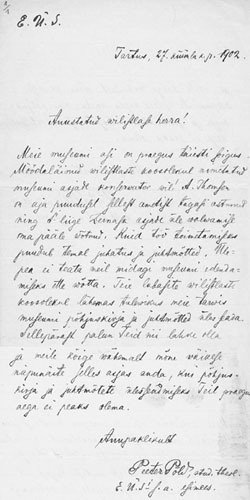 In the struggle against Russification and for the development of national education, the young Peeter Põld stood side by side with those august men, who sent a letter to the Tsar in April 1905 demanding free public education with instruction in the mother tongue. We call ourselves the Estonian Common Achievement Party. Together, we want to achieve specific political aims. As a small nation we cannot independently accomplish a great deal or influence significantly the great Russian State; we can achieve something only if we join one of the larger Russian political parties. Postimees, December 20, 1905. No. 280. 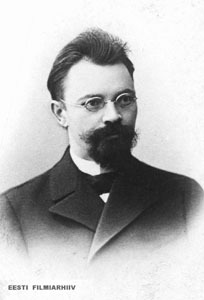 When Tartu University was temporarily closed due to the political situation in 1905, Peeter Põld started working as a journalist. From November 1905 to July 1906 he was a reporter for the daily “Postimees” and from November 1906 to February1907 he was the editor of the newspaper “Sõna” (Word) in Tallinn. In 1907 he returned to “Postimees” and also served on the editorial boards of the publications “Meie-Aastasaja” (Our century), “Sõna” (Word) and “Elu” (Life). Peeter Põld retained close contact with “Postimees” until the end of his life. 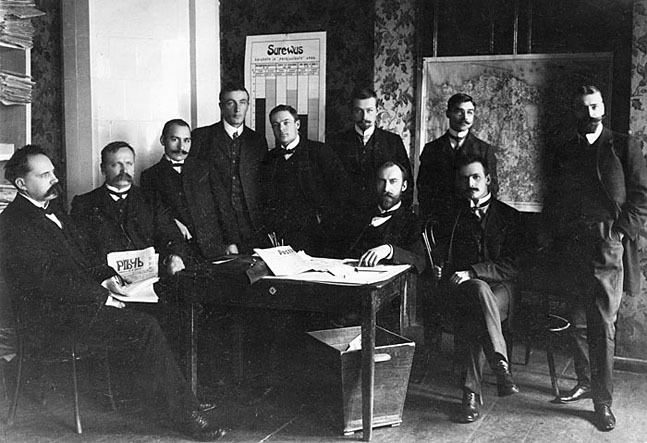 The idea of establishing an educational society had been discussed in Tartu since 1903, but it could not be realised until April 1906, when the Tsarist government allowed the establishment of schools with instruction in national languages. This opportunity was immediately seized and a planning committee of 17 members including Peeter Põld was organised. The guiding principles of the Tartu Estonian Kindergarten, which had been operating since 1905, were used as a basis for the bylaws of the Estonian Society for Youth Education (ENKS). These bylaws were later modified and expanded. Here under these trees Estonians lived their lives. They grew up and became strong. Now, we have a new and different life. If you wish this new life be fresh and happy, full of children’s voices and boundless energy, their bright eyes and rosy cheeks...to cut a long story short . If you wish this life to provide hope for a better future, then let us do something to make it happen. Let us all work together! P. Põld. About the importance of kindergartens. In: We Are Known by Our Children’s Deeds. Compiled by T. Tender. Ilmamaa. Tartu, 2006, p. 69.